Even as the fate of the Himalayan Ski village hangs in the balance, the new regime is yet to take a decision on a number of mega tourism projects for which bids have come in from big industrial houses. The farmers and residents in town will soon get a major relief from the monkey menace in the state as the government has decided to set up three special ‘monkey clinics’ at Sundernagar, Tuti Kandi and Kufri in Shimla for sterilisation of soaring number of monkeys. Chief Minister P.K. Dhumal has asked panchayati raj institutions, NGOs and the public to play a pivotal role in creating mass awareness about the benefits of total sanitation campaign. He was speaking after inaugurating a two-day workshop on total sanitation here. The workshop is being organised by the district rural development agency in collaboration with the experts of the water and sanitation programme of the union government. After getting the final nod for delimitation of the assembly constituencies by the Government of India, the biggest Nurpur assembly segment in lower Kangra district comprising Nurpur, Jawali, Gangath and Guler segments will shed its area as well as electorate. With the objective of improving rural teledensity in remote areas, Reliance Communications today announced the launch of telephone services to 5,600 villages in the districts of Hamirpur, Mandi and Solan. With the final cost pegged at Rs 1,293 crore, the 126-MW Larji Project has achieved the dubious distinction of being the most expensive hydroelectric venture in the state to date. Even as the police remand of suspended state drug licensing authority Sher Singh has been extended till March 3, the Vigilance Bureau has found fresh documents indicating benami property deals and bills of huge gold purchases made by him. The high court today stayed the order passed by the chief information commissioner, Delhi, whereby it had directed Lawrence School, Sanawar, to provide information under the Right to Information Act. The suicide bid by two girl students of a senior secondary school at Sudnernagar has once again brought into focus the stress associated with examinations. Presiding over a annual prize distribution function in the local Arya Government College today, local MLA and former chairman of the HPTDC Rakesh Pathania alleged that the previous Virbhadra Singh government had failed to expand its faculties as it had been taken over by the then Prem Kumar Dhumal government in 2002. Though the state government through a notification had decided to open two regional forensic science laboratories in the state about two years back, but these laboratories are yet to start functioning due to reported lethargy of some employees in the government. The World Bank has approved six new road tunnels in the state, revenue and PWD minister Thakur Gulab Singh said yesterday. The state electricity board employees union has opposed the policy of the Centre to “unbundling” of the state power utility and asserted that it was neither in the interest of the consumers not the employees. The executive of the union, which met here yesterday, decried the linking of power sector reforms with the grants made available to the state, which was patently wrong. Reacting to media reports concerning embezzlement of funds from the Kuthar Block Resource Centre, the concerned block primary education officer (BPEO) Jeet Ram today lodged an FIR with the Kasauli police for criminal breach of trust and cheating. Two persons, including newly wedded woman from Aligarh Deepti Goel, died when their Innova car (HR-16-2964) plunged into a gorge near the Army camp in Kufri last evening. The power supply to Chakkar, Boileauganj, Tuti Kandi, Ramnagar, Phagli , Kaman Devi and the surrounding areas will remained suspended from 11.30 a.m. to 4 p.m. on February 29. A spokesperson of the state electricity board said that power shutdown was required for carrying out urgent maintenance works. During Congress rule some prime government properties were advertised with a view to inviting investment for tourism promotion. This included setting up of a golf course at Baddi, a mini golf course at Baragaon, near Manali; a health resort at Jhatingiri in Mandi and setting up a lake resort at Bilaspur. Some big names in the hospitality industry like Raddison and Holiday Inn had sent in their bids for setting up a golf course at Baddi. Being close to the industrial estate of Baddi-Barotiwala-Nalagarh and to Chandigarh, the golf course is likely to emerge as a favourite haunt for those who love the game. The government will provide about 400 bighas of land for the golf course at Baddi. The Dhumal regime is yet to take a decision on the bids. “The fact that some very big names in the hospitality industry have sent in their bids is reason enough for us to go ahead with the bids,” admitted a senior official. However, no final decision has been taken with regard to the Himalayan ski village, a project about which the new regime has a lot of reservations along with other projects. Similarly, about 110 bighas of land is being offered at Baragaon, near Manali. The government has received about 12 bids in response to the advertisements for the setting up of a mini golf course at the picturesque locale in the Kullu-Manali valley. There is no dearth of takers even for the setting up of a health resort at Jhatingiri in Mandi. The proposed site was the erstwhile property of the rulers of Mandi and is a completely virgin area with not even the slightest traces of urbanisation. “The cool and clean environs of the place are ideally suited for a health spa for rejuvenation and relaxation,” informed an official. The Tourism Department is keen that Himachal can attract a lot of tourists through spas, the way Kerala has done. To showcase the tourism potential of Himachal, the government had organised a conclave where 15 government and 105 private properties had been offered to entrepreneurs on the theme ‘Explore HP-Invest HP’. Now it remains to be seen whether the Dhumal regime processes the bids or decides to go through it all over again. B.D. Suyal, said, “The school eco-clubs assisted by the entire team of forests officials today conducted a monkey census in all the 13 wards in town and found that there were over 104 monkeys, 65 adults and rest infants in 17 troupes in Mandi town. The number could vary. There could be more monkeys in the wilder sides, he added. Suyal said monkeys would be admitted to the hospital for three to four days, where they would undergo proper anaesthesia before they are sterilised. After that, they would be released back into the wild, he added. Professional catchers from Rajasthan will be hired to catch the monkeys for sterilisation. “They charge Rs 60 per catch or so. They will catch simians not only from Mandi but other areas like temple sites, urban centres and parks where monkey menace has assumed alarming proportions,” Suyal added. The animal census of 2004 says that there are over 5,713 tropes of monkey and 1,354 tropes of langoors having total number of over 3.17 lakh monkeys and 53, 331 langoors in the state. They feed on crops and fruits in rural areas and spreading towards towns and temples sites where pilgrims and residents feed them or they feed on waste bins. More worrisome is that fact that though langoors are man-shy but there number is soaring in and around urban areas. “The 2004 census says there are over 379 animals in towns 346 in temple sites and over 2,091 in rural areas, preying on fruits and crops. As many as 53,331 langoors live in the forests,” census says. DFO, wildlife Hamirpur, S.K. Guleria, who gave detailed lecture on monkey menace here today, said, “On an average a female adult monkey gives more than 48-50 births in its life span of over 20-25 years. Monkey menace is on rise as people feed them due to religious sentiments. Chief Minister P.K. Dhumal inaugurated a sewage treatment plant here today. The project has been completed at a cost of Rs 17.56 crore. It would facilitate Bhagsunag, Dharamkot, Forsetganj, Naddi villages, McLeodganj and lower areas of the town, he said. “It has provision for 2,933 house connections, out of which 750 have already been released. Efforts are on to connect every house with sewerage line,” he added. He said such organisations should educate people and encourage them to construct toilets in their houses so that environment was not polluted. He said defecation in the open had been responsible for polluting water sources leading to various health problems. Ajit C. Kumar, who is looking after the implementation of the scheme in South-Asia, said there was a need to motivate the community to change behaviour and seek introduction of sanitation facilities without external subsidy, which would ultimately lead to improved health and self-esteem. Millind Saxena, sanitation coordinator of the state for the project, said the society needed to be sensitised on the use of toilets because there were reports that in some cases the toilets constructed under this programme were not being used properly. Bhavana Luthra, coordinator of the ‘knowledge links’, an NGO assisting in the implementation of the project, said there were at least 45 master trainers in each district of the state for the purpose. Later, the CM honoured panchayat representatives of Simbal Khoula, Saliana villages of Panchrukhi block; Rehan, Jachh of Nurpur block; Jaangal of Nagrota Surian block; Kathgarh of Indora block; Haar, Pragpur of Pragpur block; and Ban Ghiyar of Bhawarna block, that had been recommended for ‘Nirmal Puraskar’ of the Union Government. An inquiry made in the new set up reveals that Nurpur will shed 12 gram panchayats named, Rehan, Khehar, Nanooh, Vari Batrahan, Talara, Golwan, Nerna, Kandor, Chhatar-khas, Chhatar Jogian, Kandor and Minta. Whereas, it will get three new gram panchayat of neighbouring Gangath assembly segment named Kandwal, Baranda and Rit. Significantly, barring Nurpur assembly constituency, all three constituencies will be re-named. The Jawali constituency will be now re-named as Fetehpur, Guler as Jawali and Gangath as Indora. Earlier, the Nurpur assembly constituency had over 87,000 electorate. The phones being provided under the universal service obligation fund (USOF) would be provided through rural household direct exchanges lines in specifies short distance charging areas by March 2008. The USO fund helps subscribers living in rural locations to avail telecommunication services at a subsidised cost. “With the help of this technology even those stationed at remote places can enjoy the benefits of mobile telecommunication as a patch-panel antenna would be fixed at every household, enabling superior connectivity and good voice quality,” said Rahul Chaudhary, chief operating officer, Himachal Pradesh, Reliance Communications. He informed that to boost rural penetration of telephones, Reliance Communications has come out with a slew of exciting offers such as two-year free incoming with new classic fixed wireless phones at Rs 699. He added that the Reliance tariffs were very attractive and affordable to benefit rural people who have come to realise the necessity to stay connected with the rest of the world. Apart from huge cost and time overruns, the project was plagued by large-scale financial irregularities, corruption and substandard construction works. The cost of the project executed by the electricity board more than doubled from the approved Rs 640 crore (at 1999 price level) and it was completed more than four years behind schedule. As per the application filed by the board before the state electricity regulatory commission for determination of tariff, the cost of generation comes to Rs 5.43 per unit. The per-megawatt cost comes to Rs 10.35 crore as against 5.5 crore for the Nathpa Jhakri Project that has also been executed over the same period in the pubic sector. The cost in case of two private-sector projects, 300-MW Baspa Project and 86-MW Malana Project, comes to Rs 5 crore and Rs 4 crore per megawatt, respectively. How costly the power from Larji is can be judged from the fact that the commission had fixed the rate for purchase of power from the small hydro projects, which are much more expensive than bigger projects, at Rs 2.82 per unit. It worked out the tariff for the Baspa project at Rs 2.85 per unit. The average sale price of the board is only Rs 3.68 per unit. During the course of implementation, the commission had expressed its displeasure over the failure of the board to carry out its directions to investigate the abnormally high cost of the Larji Project. Eventually, it instituted an independent probe that uncovered gross irregularities and numerous deficiencies in the construction work. It indicted the management of the board and recommended action against the then chairman and the members concerned. It also recommended that a comprehensive vigilance inquiry be conducted into various financial irregularities to fix responsibility at the lower levels. After taking into consideration all factors cited by the board for the delay, the two-member expert committee put the cost of the project at Rs 960 crore. It remains to be seen whether the commission determines the tariff on the basis of the cost submitted by the board or goes by its own inquiry report. The Vigilance Bureau, which is still scrutinising the documents recovered from the suspended officer’s house in Solan and Shimla, has found bills of gold purchases worth Rs 6 lakh made from Chandigarh within a short span of time. Vigilance sleuths have also got information about three new bank accounts held by him and members of his family in Chandigarh. As apprehended the Vigilance Bureau has been able to lay its hand on some documents which clearly indicate towards benami land and property deals by Sher Singh, who has a lot of property in the name of his mother-in-law Avtar Devi, who has been questioned by the police. The Vigilance Bureau is probing foreign remittance receipts in her name. Sources said Sher Singh during questioning has feigned complete ignorance about these foreign remittances. However, with the mother-in-law of the suspended officer receiving money from abroad, the police suspects that Sher Singh or his family members could be holding foreign bank accounts. The Vigilance Bureau has also found out that the flat in Strawberry Hill, owned by Sher Singh, is a recent acquisition as the house is does not have furniture or other material. With regard to the recovery of the seal of the drug controller being recovered from Shivam Enetrprise, a business enterprise run by the son-in-law of Sher Singh’s brother in SDA Complex, New Shimla, the family is claiming that he was acting as a liaison agent for pharmaceutical companies at his own level. Sher Singh Thakur was today further remanded in police custody till March 3 by a local court here. Meanwhile, it was learnt that bureau sleuths had summoned three pharmaceutical units from the Baddi-Barotiwala-Nalagarch industrial area. They said that these units included Torque Pharmaceuticals, Scottedil and Health Biotech. 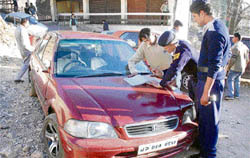 These units had been directed to appear before the bureau and join investigations on specific dates.The bureau sleuths earlier interrogated the owner of a local pharmaceutical unit, whose vehicle had been used by Thakur to visit Baddi on February 22, while he was caught by the police with cash worth Rs 4,88,500. Inquires were made into the ownership of the said unit and an in-depth scrutiny of partnership records like list of shareholders and directors list were verified in the over two hours of inquiry made at the unit. Inquires made from the industrial area revealed that one of the three firms summoned to appear before the bureau now had shot into limelight last year, when their certain batches of an injection had to be withdrawn from the market after they were mislabelled. The bureau was now inquiring as to why a huge amount of money exchanged hands between the drug manufacturers and the suspended drug controller. Passing the interim order, Chief Justice Jagdish Bhalla and Mr Justice Deepak Gupta directed the respondent to file reply in four weeks. The petitioner school has challenged the order of the information commissioner on the ground that the school management is not covered under the definition of “public authority”. The school management further contended that the provisions of the Act were not applicable to the privately managed school. The commissioner had not afforded any opportunity of being heard to the school management before passing the order, the petitioner said. Earlier, Rajinder Singla, a resident of Chandigarh, had sought some information from the CBSE with regard to the affiliation and functioning of the school. The board did not give satisfactory information. The applicant filed an appeal before the information commissioner against the passive attitude of the board. The information commissioner directed the school management to provide information to the applicant. Feeling aggrieved, the school management then approached the high court. Savitri and Sarika (names changed), who were allegedly under stress due to school examination, took the drastic step and consumed poison at Kanaid village. They were taken to the zonal hospital on Tuesday. Fortunately, doctors were able to save them. They were discharged from the hospital On Wednesday. Several such cases are reported in the state during examination time. However, neither the Education Department nor the parent-teacher associations seem bothered to take stock of the plight of students. There is hardly any arrangement for holding preschool examination stress management programmes to help out students. According to education experts, teachers’ and PTA unions are more concerned about their demands and resolution of students’ problems takes a backseat. He disclosed that a new proposal was being mooted by the present state government in which, the present government college would be shifted in the new complex. For this, Revenue Department officials had been asked to select a requisite land in the town, whereas, the existing college building was being vacated for Government Boys Senior Secondary School, which had to be shifted from its present venue on the premises of the centrally-protected monument, Nupur Fort. He clarified that the school would be called Arya only, whereas, the proposed new premises of the government college would be named after Justice Mehar Chand Mahajan the first Chief Justice of Supreme Court of India, who hailed from the Nurpur area. On this occasion, the chief guest gave away prizes to the meritorious students and they presented a colourful cultural programme. At present there is only one forensic laboratory functioning at Junga (Shimla), which is catering to forensic analyses needs of the entire state. Since the need for opening few more forensic laboratories was felt for quite some time with the increase in crime graph, the state government through a notification had decided to open two regional forensic science laboratories at Dharamshala and Mandi in June 2006. The government had also sanctioned one post of deputy director, three posts of assistant directors, three posts of scientific officers, three posts of scientific assistants, three posts of laboratory assistants and three posts of laboratory attendants, besides other posts of ministerial staff each at both the places. Opening of these laboratories is important as these will help in criminal investigation and prosecution of cases. These laboratories will also help in breaking long stagnation among employees of the State Forensic Laboratory at Junga. Sources in the department said the government had hired buildings for establishing the laboratories at both the places recently, but the staff had not been posted and equipment was installed. Secretary home to the state government P.C. Kapoor told The Tribune that the posting of staff was in the process and regional forensic laboratories would start functioning soon. Unbundling had not improved the financial health of power utilities in other states and it would undermine the social security of employees on one hand and increase the burden on consumers, on the other. It urged the government to take up the matter for grant of extension with the centre under the Electricity Act 2003, so that the board could continue in the unbundled form. It criticised the management of the board for not holding any meeting with the union for discussing the various pending issues. Several demands like creation of more posts to cope with increased workload, restoration of the annual increment of class IV employees, removal of stagnation, regularisation of daily wagers and filling of vacant posts. The union termed the merger of the Pabbar Valley Power Corporation and the Kinner Kailash Power Corporation into the Himachal Power Corporation as unfortunate and against the interest of the board, which had only 40 per cent equity in the new public sector undertaking. Further, the Sainj project, which was allotted to the board had now been assigned to the Himachal Power Corporation. The board will be left without any project. Confirming this the police officials said a case under sections 409, 420 and 477-A of the IPC for criminal breach of trust and falsification of accounts had been registered against Madhu Kumar, the block resource centre’s coordinator. This case was registered on the complaint of the BPEO. The police further revealed that the case came to light after the new BPEO took over on January 1 and convened a meeting of 24 concerned schools to assess the work executed under this scheme. These schools were to receive payments for repair and maintenance as provided under the Sarv Shiksha Abhiyaan (SSA). However, a scrutiny of the concerned pass book, which was a joint account of the BPEO and the block resource centre’s coordinator, revealed that there were just Rs 917 in the account, while a sum of about Rs 7 lakh had been embezzled. The sum was to be released as final payment for repair and maintenance of these 24 schools. Though these facts were known on January 21, when the meeting was convened, but instead of getting a case registered, the department virtually tried to grant time to Madhu Kumar to deposit the funds. The DIET, which is the district executing agency for SSA, woke up to prepare a report of the matter only after mediapersons raked up the issue. This report was delivered personally to the director’s office late last evening by the DIET principal himself. The delay caused in bringing the matter before the notice of the director and in getting the case registered has raised a finger of suspicion towards the role of the concerned officials. Saurabh Goel, who married Deepti Goel only a week back, arrived here yesterday for honeymoon. The couple, who checked into a hotel in the afternoon, left for Kufri in the evening along with hotel guide Parvez. Deepti and Parvez died on the spot while Saurabh and driver Dinesh sustained serious injuries. Saurabh, who hails from Aligarh, runs an ice factory in Haryana. The family members of Saurabh, who is undergoing treatment at the IGMC, arrived here today. Hamirpur: Ashwani Kumar was killed and four were injured when a Zen car (HP -22 A- 5393) plunged into a deep gorge near Sujanpur on Wednesday evening. While Ashwani Kumar died on the spot, Anoop, Rohit, Subhash and Desh Raj were injured. All of them were returning from Sujanpur after attending a marriage when their car rolled into a gorge near Banaina village.